Sample shown with Grey ink and optional Black lining. Sample shown in Sage ink and optional Sage lining. Exclusive to The Stationery Studio! 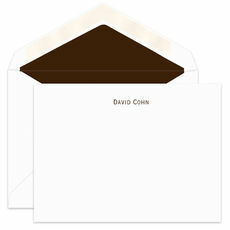 Set of 50 plain white flat correspondence cards, sized 5.25" x 4" and 50 white envelopes. You select your favorite raised ink color for note cards. Printed return address printed with flat ink available. Typestyle and positioning only as shown.